India Religion Consists of the Numerous Religions Practiced in India. India Religion has always been an important part of the country's culture and its value system. Even in ancient India, religion played a major role in defining the region's traditions and values. The religions of India themselves each have an interesting history. In fact, ancient India religion shaped many branches of the popular religions practiced in India today, but the most ancient religions have evolved and no longer exists in their original form. For example, most early Indian tribes worshiped sun-gods. In India, you can see religion everywhere. People freely express their worship, faith, rituals, and religious celebrations in the open. Many religions are practiced in India and it's both customary and written law that people living in India live by religious acceptance. This means people are required to tolerate the religious choices of others and all religions must coexist in India. So, for example, if you are a Christian living in India and your neighbor is of the Hindu faith, you must accept your neighbor's choice to follow a different religion than you follow. 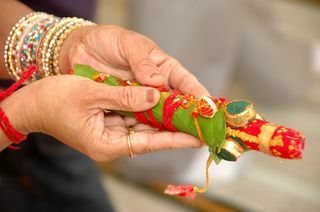 Pictured above is a decorative ceremonial stick which is intended to give blessings to its receiver, through Hinduism. Of the Many different religions found in India, a few were born there, while others were brought to India by people from other countries. These people came through trade routes and waterways and brought their belief systems with them. Religions such as Hinduism were born in India during ancient India history. The major religions practiced in India today include Christianity, Buddhism, Jainism, Judaism, Islam, Sikhism and of course Hinduism. Hinduism is the most widely practiced religion in India with 80.5% of the population following its belief system. Islam accounts for 13.4% of the population, followed by Christianity at 2.3% and Sikhism at 1.9%. The other 1.9% of the population follows either Buddhism, Jainism or Judaism. These coexisting religions have played a large role in structuring the culture and lifestyle of the Indian people; they also helped to form today's Indian culture. Leave India religion and explore India's colorful culture. Find out why the food and culture of India are inseparable.